This decision will eventually have such a widespread and disastrous impact on the Middle East region that the interventionist diplomats, media, generals, and academics who advised President Trump to arm the Kurds will have to fall back on a paraphrase of that old Iraq-War, Bush lie, “We did our best and the calamity that resulted from our decision to arm the Kurds is a case of unintended consequences.” When the worst occurs, anyone with a bit of commonsense will recognize that the failure, destabilization, and additional war that has resulted from arming the Kurds was something that (a) was perfectly and easily predictable and (b) another long step into a fatal swamp in which America has nothing at stake save the feelings, sensitivities, and ardor for lucre of the already rich American governing elite. But first, take a quick look at the two maps that follow. As can be seen, there are substantial Kurdish populations in Syria, Turkey, Iraq, and Iran, and, at least in Iraq, Kurdish territories sit upon enormous oil and natural gas reserves. Each of those four nations has long feared the Kurds’ strident demands for an independent Kurdish state, their fighting abilities, and their fiery nationalism. As fear always does, the nations’ fear of the Kurds has led to their economic, social, linguistic, and — at times — military oppression by each government. In short, Syria, Iraq, Turkey, and Iran have long seen their Kurdish populations as malcontents bent on independence and so a threat to their territorial integrity. Now along comes Uncle Sam, having been assigned by the interventionists to again stick the republic’s already badly bloodied nose into other peoples’ wars. He brings in his pack, the media report, weapons that are probably superior to any the Kurds have had in their modern history, as well as top-of-the-line military vehicles. Uncle Sam also brings Special Forces trainers/advisers, and ongoing air support from the U.S.-led, anti-Islamic State (IS) coalition. Lastly, he brings the U.S. national government’s okay for the Kurds’ military forces to advance out of the areas that they have traditionally dominated and engage IS mujahideen in areas that have little or no Kurdish population. In other words, they have the okay of the United States to occupy territory that historically, ethnically, and/or religiously belongs to non-Kurds, and there is no indication that our genius diplomats and generals have given much thought to the problem of how to affect their eviction from those territories and get them to return home when/if the battle against IS is won. Quite obviously, this is another case of mindless U.S. interventionism running amok. Of the four states coping with restive Kurdish populations, only the Turks have publicly denounced Washington’s policy of arming and training their Kurdish enemies. It is difficult to imagine, however, that the Syrian, Iraqi, and Iranian regimes are any more pleased than the Turks with the republic’s intervention in the Kurdish problem that it manifestly does not understand, and which will make a much more effective and battle-hardened military force of the separatist-minded Kurds. None of those states could possibly believe that the Kurds assistance in taking ar-Raqqaa is worth the future war it is breeding between them and the Kurds. The question, as usual, is why do the national government’s supposedly world-class political, economic, and military brains continue to prove themselves so absolutely ignorant of the way the world works, how others live and govern, and of what genuine U.S. national interests look like. Since the start of the Arab Spring, U.S. involvement in Syria, under both parties, has been based on ignoring reality and disabling the Washington’s policy community’s commonsense function. The unnecessary, arrogant mistake that over-arches the Syria issue was the Obama administration’s declaration — which was supported by most Republicans — that the so-called “Arab Spring” marked the success of U.S. policy in the Middle East, and the launching of an unstoppable surge of secular democracy across the region. I recall being on a FOX News panel on the day Mubarak resigned and saying that the Arab Spring could only yield a telling victory for Osama bin Laden, al-Qaeda, and the international Islamist movement. I was virtually hooted of the set by the other panelists, and this for saying something that was crystal clear to anyone but an arrogant deluded interventionist. Simply put, calling the Arab Spring a huge victory for Islamism and the mujahideen was just about the most easy and rudimentary piece of accurate analysis that can be imagined. Why, after all, would tens of millions of North African and Levantine Muslims celebrate the fall of dictators — in which they surely saw God’s hand delivering the answer to their prayers — by turning their back on a deeply held faith in the God that sustained them during decades of dictatorial rule? The argument that secular democracy was at hand because of the Arab Spring could only come from a lying interventionist or someone educated in the U.S. university system and who never challenged the leftist, anti-religious, and pacifist nonsense imparted to him as historically accurate knowledge. The U.S.-Western coalition’s knowing consignment of more than a million Syrian Alawites to annihilation if its main goal of destroying Asaad’s government is attained. That coalition’s false claim that non-Islamic State, Islamist insurgent groups are less radical, less bloodthirsty, and more pro-western than IS, al-Qaeda, and other mujahideen groups. That coalition’s decision to fund, arm, and train these supposedly “moderate” groups, which — if Russia does not save the day and Asaad’ regime is eradicated — did nothing but ensure the ultimate Islamization of Syria, Jordan, Lebanon, and Egypt. The expansion of Iran’s influence throughout Iraq and across Syria via its own military and intelligence forces and Iraq’s Shia militia force, which are now also operating in much of Syria. The “Shia Arc” the Sunni world long feared is now complete. It ranges from Iran’s border with Afghanistan all the way to Shia Hizballah’s bastion on the Mediterranean’s waters, and all built by the U.S.-Western interventionist coalition. The same coalition is now expanding its military presence in the Syria-Iraq theater. It is focused on capturing cities — as if it was the drive from Normandy toward Berlin — which will do nothing but free all Islamist forces to wage insurgent warfare against all of their foes. The war that the coalition generals have always said “is like no other” has turned into World War II’s European Theater, but with no plausible expectation of crippling IS and the other Islamists, let alone final victory. It would be hard to think of another measure that could worsen the situation which has been produced by the five actions above, but the interventionists’ blanket stupidity should never be underestimated. They have now come up with such a measure by rubbing the genie’s lamp and freeing — and arming — the lethal genie of Kurdish independence-seeking and territory-grabbing, a genie that Syria, Iran, Iraq, and Turkey have kept in check at great cost to each nation, and especially to the Turks. Today, the U.S.-armed Kurds are advancing in several directions out of their traditional homelands and into new territory. If ar Raqqa is taken by the U.S.-led coalition, with the Kurds in the van, do our generals believe that they can simply say to the Kurdish leaders, “Thanks a lot. Now, bury your dead and go home”? That may happen, but the odds are that the only way the Kurdish genie can be put back into the lamp is if they are militarily forced into it and the lid is sealed permanently. And if the U.S.-led coalition does not move to evict the Kurds from non-Kurd territory, and instead supports the creation of an independent Kurdish nation, do U.S. forces fight alongside the Kurds against the Syrian, Iranian, Turkish, Iraqi regimes, and most of the Islamists, none of whom will stand for an independent Kurdish state, let alone one that annexes pieces of Arab or Persian territory? If that is what our national government decides, it will also be signing on to help the Kurds conquer more territory. Why? Take a second to again look at the maps above. 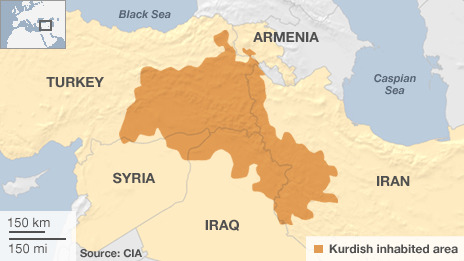 Clearly an independent Kurdish nation limited to its historic territory would be landlocked. It would be sitting on huge reserves in oil and natural gas, but could never be sure that those resources would get to market because the pipelines needed to move them would be controlled by its enemies. The only possible answer to this problem would be to annex a territorial corridor — almost certainly through Syria — that would allow the Kurds to reliably move their energy resources to the Mediterranean for export. Another war to kill U.S. Marines and soldiers for oil we do not need, anyone?